When planning an event, chances are you’ll end up renting something. Linens, stemware, tables, chairs -no matter what you’re renting, there are important questions to ask your vendor. These questions will help you determine the right vendor to work with and put your mind at ease. When renting more than one of the same item, it is important everything matches. Some vendors focus more on quantity than quality, resulting in mismatched plates, napkins, stemware, linens, etc. Attention to detail matters. Asking your vendor if the items they rent out match is a great starting place to determine whether this is a vendor you want to work with. Do you provide design and planning assistance? Beyond the rental process, you need a professional who can assist you with your event’s overall planning and design. For example, the professionals at RSVP Event Rentals offer free site assessments and layout design. Not only does this help you execute your design plans, it ensures your vendor has enough understanding of your vision to suggest the right products to meet your needs. Delivery services are common and convenient among rental vendors. However, you don’t want to get hit with an unexpected fee. From the start, be aware of whether or not delivery is included in your overall rental bill. Do you have set-up or take-down services? Depending on the nature of your rental, set-up or take-down services can be extremely helpful. They are particularly helpful when renting large or technical items. Most vendors charge extra for these services, but this is definitely something to consider budgeting for. Not only does it make less work for you, it removes your liability for damages that could occur during this time. Do you have referrals for other vendors? Due to the nature of their business, rental vendors can be a wealth of information when it comes to referring other vendors. Whether you’re looking for a caterer, florist or DJ, your rental vendor should be able to point you in the right direction. 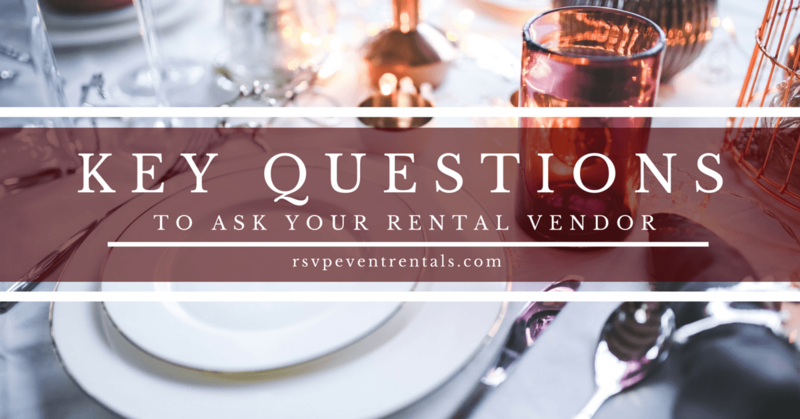 Whatever your questions may be, the professional rental coordinators at RSVP Event Rentals are prepared to answer! Come in today to talk to one of our staff.